01. 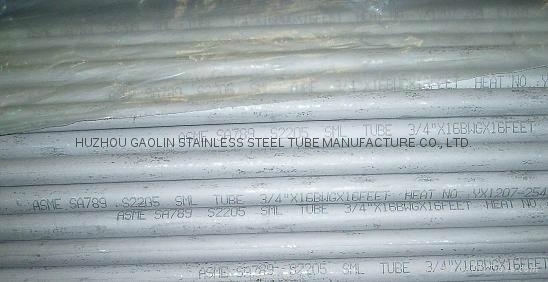 Commodity: ASME/ASTM SA/A789 UNS S31803, UNS S32205/SAF2205, UNS S31260, UNS S31500, UNS S32304 seamless ferritic/austenitic stainless steel heat-exchanger tubing. 03. Surface finish: annealing, pickling and polishing as required. 04. Material: S31803, S31500, S32205/SAF2205, S32304/SAF2304, S31260; 1.4410, 1.4462, 1.4501, with corresponding GB, ANSI, EN, JIS, BS & ISO material designations. 05. Specification: JIS G3463, EN10216-5, EN10297-2, ASTM (ASME) A/SA789 & GB13296. 07. Length: Max. 25 meters. 08. Applications: for boiler, superheater and heat-exchanger service. 09. Packing: plastic bags for each piece, then packed in seaworthy plywood case or wooden case or iron case.